turkey tetra, turkey tetra, turkey tetrazzini! – ugly food tastes better. I went back and forth on all the things I could do with leftover turkey, before finally settling on something I havent made in awhile and LOVE to say. 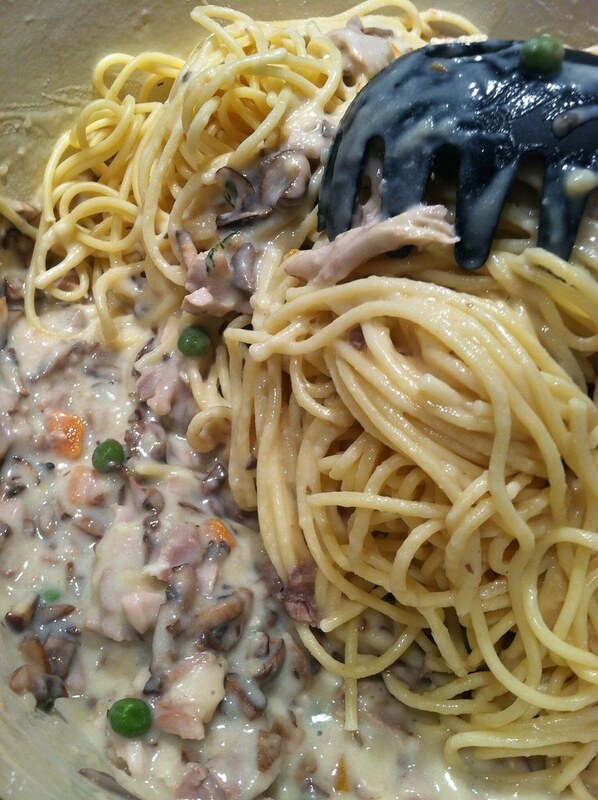 Turkey Tetrazzini. Now no one really has any idea where this dish originated, BUT the Internet meme is really all you need to know. I had Thanksgiving dinner with my incredible friends Jamie and Chris, who can both cook like whoa. And of course, they go all out and start our meal with an amazing wild rice and vegetable terrine, and a table set with individual carafes of wine. 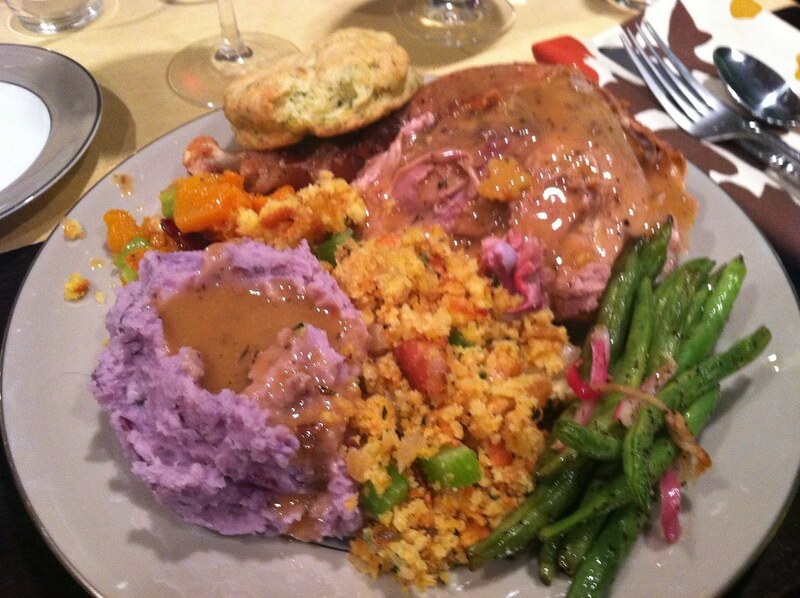 Green Bean Garlic Bundles, Caramelized Onion Bacon Cornbread Stuffing, Roasted Butternut Squash Salad, Dill Seed Biscuits, Mashed Purple Potatoes and Spiced Gravy, Fresh Cranberry Sauce, Truffle Butter and Herb Roasted Turkey and Individual Pumpkin Cheesecakes with Cocoa Sour Cream Frosting. 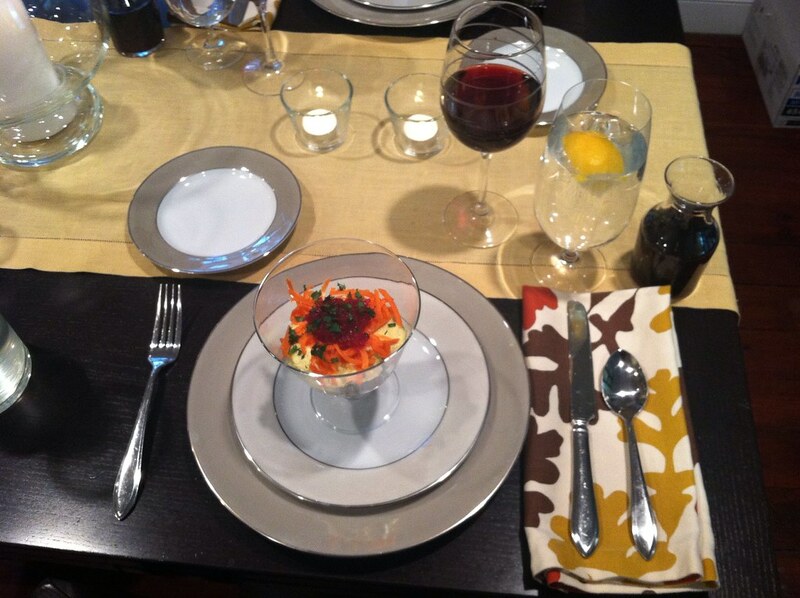 You just couldn’t ask for a better meal, and what a beautiful plate it was! It might be blurry because I had been drinking. Who could say? I took home all of the dark meat, and they kept the light meat. We all know I am not a huge fan of birds, but I have been trying to incorporate leaner protein in to my diet, and this was a good opportunity. That is, until I started peeling the skin off the wings and disassembling them and almost threw up. Regardless, do that! And then you will be ready! I tried to healthy this up a bit, and I will let you know where I made changes, adn what other changes you can make, as this was like, my transition meal from being pretty unhealthy for a few days into being healthy again, haha. I also used almond milk instead of regular because in my quest to consume less dairy, I have found I really enjoy cooking with almond milk because it has a great flavor. 1 box pasta of choice, cooked al dente and well drained. OKAY! So prep your ingredients while you cook your pasta, drain in COLD water and set aside. 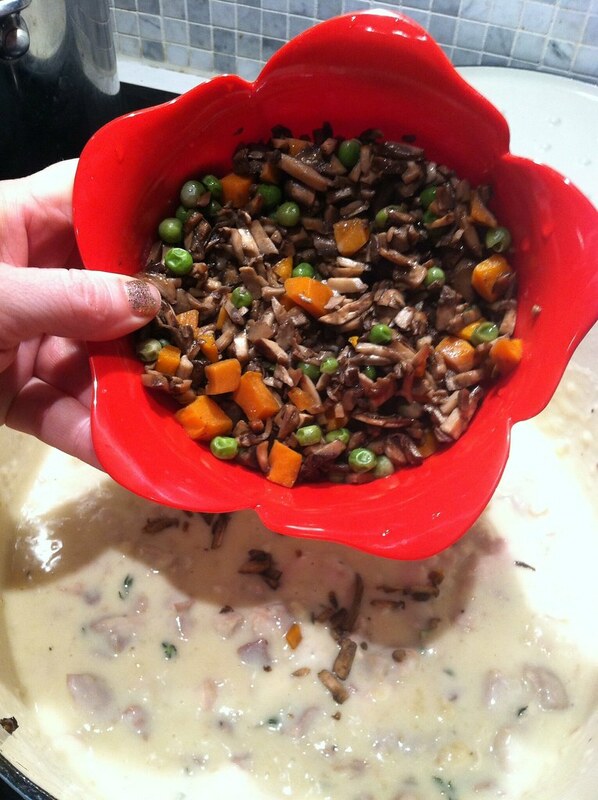 Then sautee the carrots, peas and mushrooms in 2 of the tablespoons of butter. If you want to get healthier, sautee in broth. 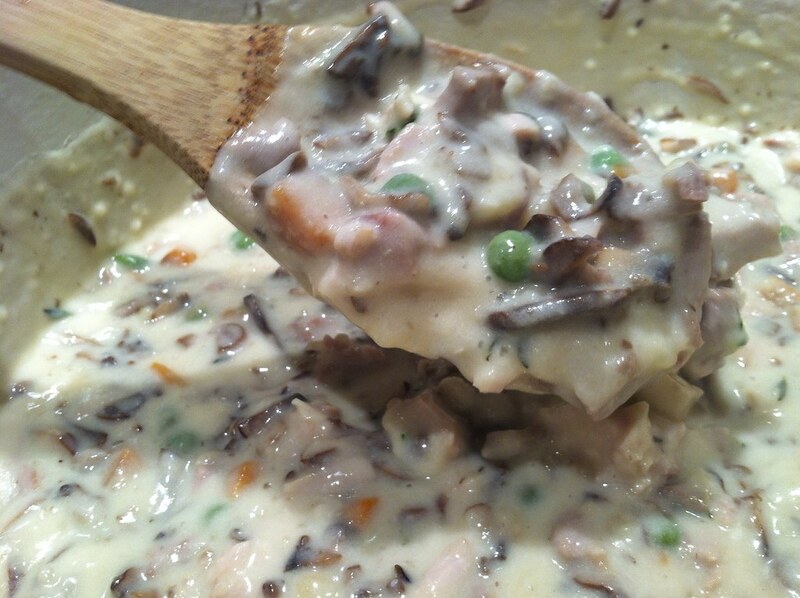 Also, I used frozen carrots and peas, if yours are fresh, cook them for 10 minutes before you add the mushrooms. Set them aside. I put mine in a colander to drain any excess liquid. 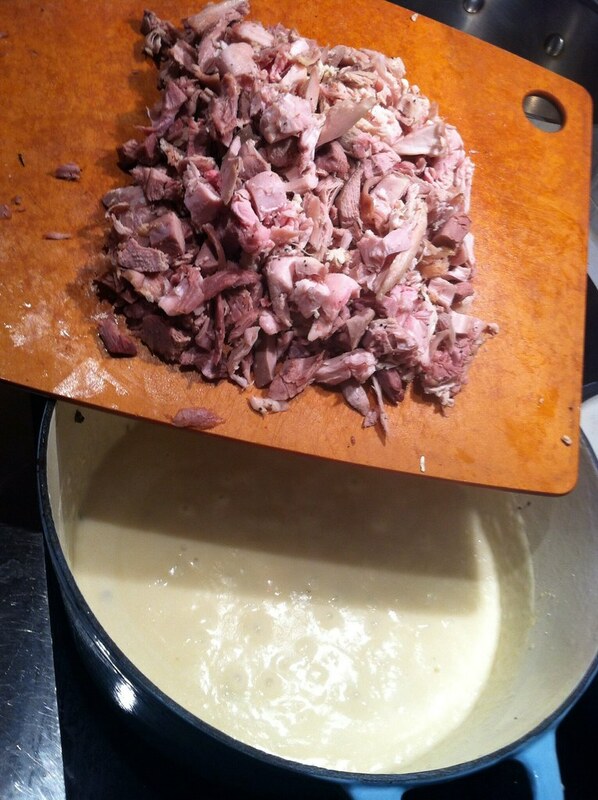 Then use the rest of the butter and the flour to make a roux, whisking the two together in the bottom of your stock pot on medium heat. Then add milk and broth gradually and bring to a low boil and add parmesan and stir. (On an alternate note, if you want to be unhealthy but make this extra delicious, add an extra cup of parm here.) Once blended, add thyme and fresh ground pepper and stir. Then its time to add your bird! Stir and then add veggies! Now you should have a thick and delicious looking sauce…. 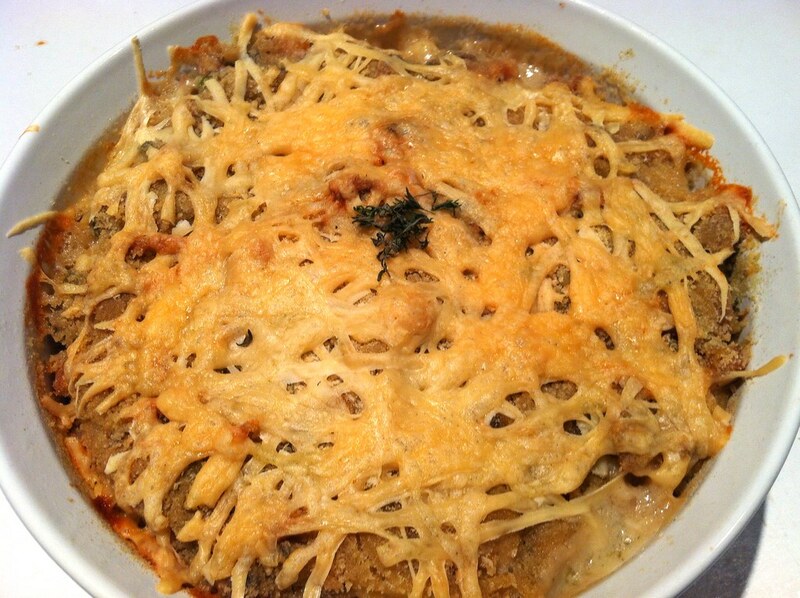 Preheat your oven to 350 and then get out your casserole dish of choice. I used a 10″ round deep one, and then froze the rest for later in life. Then mix your pasta in to your sauce and pour in to your dish, spreading flat and even. Then cover in breadcrumbs and Parmesan to make your crust, and pop in the oven for 35 minutes, and remove when the crust is your desired level of crispy. I dont wait to cut, I want to let some heat out so it will cool faster. So I cut a hunk out and put it in a bowlplate (Yes that is a word now, cause I said so.) and then it cools and gets in to my face way faster. And boy was it superb once it got there! Love me some leftovers, and glad lunch for work tomorrow is taken care of. I am sure after eating this I will in no way whatsoever want to take a nap on my desk. But I am going to the gym after, and I need fuel for that! Light meals are for dinner, not lunch. That looks so good. 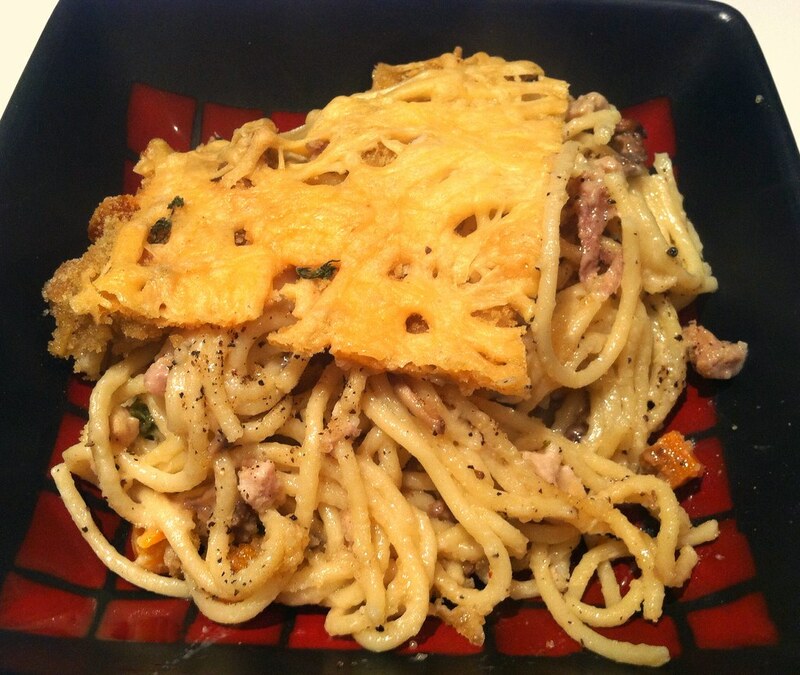 Turkey Tetrazzini is the best use of leftover turkey in my opinion. I like that you added carrots and peas. That takes on a chicken pot pie twist and adds the benefits of veggies. Good plan. Looks absolutely wonderful. I do love me some Thanksgiving leftovers! 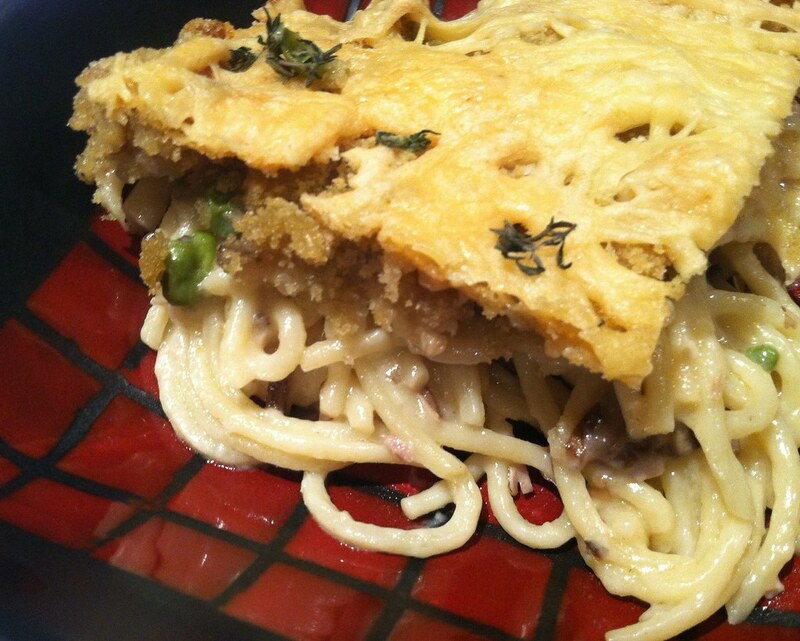 It is definitely the love child of pot pie and chicken alfredo haha. I almost want to defrost the rest and have it again already!